The influencer marketing landscape has evolved quite a bit over the past few years. With the changes in trends, marketers also need to adapt their marketing strategies to ensure that their campaigns deliver impressive results. According to a study conducted by Linqia, 39% of marketers say they plan to increase their influencer marketing budget in 2018. 35% are still unsure how they’re going to make changes to their budget, and only 5% say that their budgets will decrease. The remaining 21% say that their budgets will remain the same. The study also showed that a majority of marketers will spend anywhere from $25,000 to $100,000 on influencer marketing. Only 7% of marketers in the study said that they will be spending less than $10,000 on their campaigns this year. The same study also found that marketers are still experiencing massive issues with measuring the returns on their campaign investment. 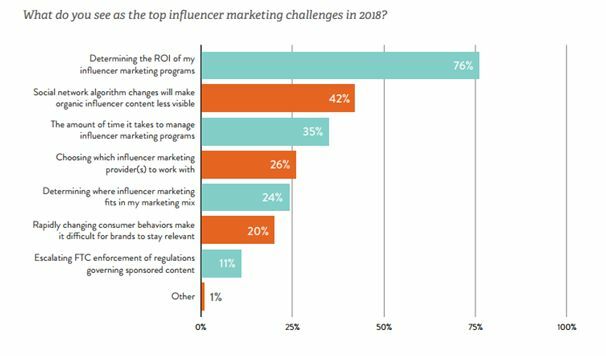 76% of marketers in the study say that the biggest influencer marketing challenge for 2018 would be determining their campaign ROI. This has consistently remained a big influencer marketing challenge for a couple of years. Even in the previous year’s study conducted by Linqia, 78% of marketers considered it their biggest challenge. Hopefully, with the emergence of advanced influencer marketing tools, marketers should have an easier time measuring the effectiveness of their campaigns. And we should expect to see an improvement in these numbers. 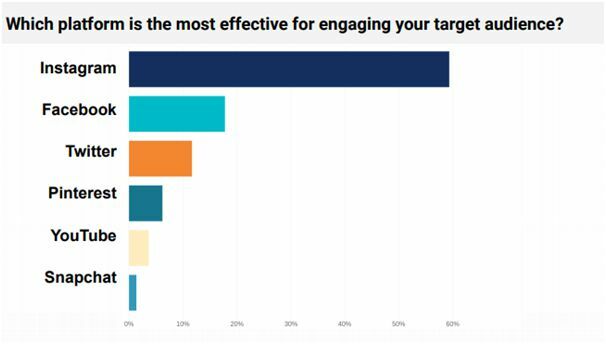 While marketers are facing an issue measuring the ROI of their campaigns, the main metric they use for measuring campaign performance is campaign engagement. 90% of marketers in the study said that they use engagement rates to measure the success of their influencer marketing campaigns. In addition to this, there are several performance metrics that help marketers measure the success of their campaigns. 59% of them said that they measure campaign performance based on clicks. 55% use impressions, and 54% use conversions to measure the results of their influencer marketing campaigns. Reach is another commonly used metric, used by half the marketers in the campaign. 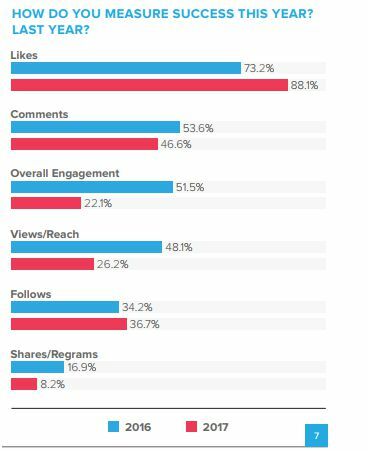 But for influencers, likes seem to be the number one metric for measuring their performance. According to a Hashoff survey, 88.1% of influencers used likes to measure the success of their content. The second most popular metric is comment rate, which 46.6% of influencers chose as their method of measuring campaign success. Since the popularity of influencer marketing, there have also been several instances in which brands get put in the hot seat because their influencers failed to follow the FTC guidelines on social media endorsements. If your brand gets under fire because of failure to comply with the FTC regulations, you could face serious fines. This means more expenses on influencer marketing than you had initially expected. The good news is that more and more marketers are building their awareness of the guidelines developed by the FTC. 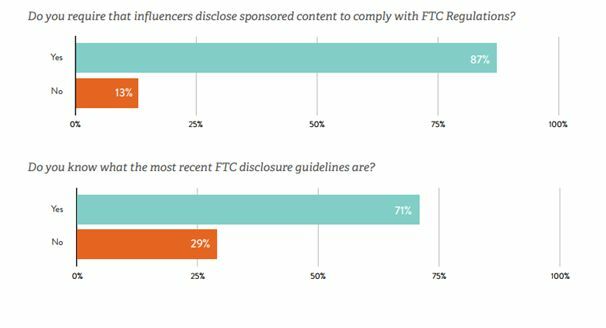 According to the previously-cited Linqia study, 71% of marketers say they are aware of the most recent disclosure guidelines of the FTC. This is a huge improvement from the previous year, during which only 55% of them said that they are aware of these guidelines. Influencer marketing can be conducted on various social media platforms. But among all the social networks available, Instagram seems to be a universal favorite. 92% of marketers in the Linqia study chose it as the most important social platform for influencer marketing. 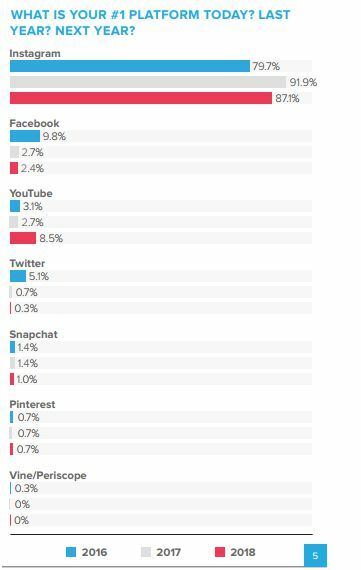 Snapchat seems to be the least favorite among marketers when it comes to working with influencers. But marketers aren’t the only people favoring Instagram. 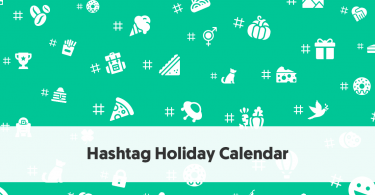 The previously-cited Hashoff study found that Instagram is the ultimate favorite of influencers as well. 87.1% of influencers in the survey chose it as their number one platform for 2018. 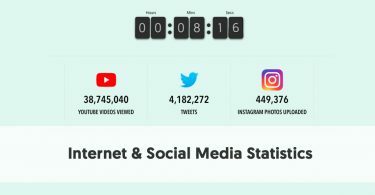 YouTube seems to be a second favorite, but only 8.5% of them chose it as their top social platform for 2018. In addition to this, 99.3% of influencers in the study say that they use Instagram to help execute influencer marketing campaigns. 67.1% say that they use Facebook, while 50.8% say that they use Snapchat. 43.1% use Twitter, and another 29.8% use YouTube to execute these campaigns. Another study by Bloglovin’ also found that a majority of influencers use Instagram to post original content. 60% of influencers in the study chose Instagram as the most effective platform for engaging their target audience. And more than 50% of influencers in the study chose it as the best platform for posting branded content. Influencer marketing isn’t as expensive as you may think it is. In fact, it is highly flexible for marketers with varying budgets. From influencers who charge thousands of dollars per social media post to micro-influencers who charge only a few hundred dollars, there’s an option for everyone. According to the previously-cited Bloglovin’ study, 84% of micro-influencers charge $250 or less for each sponsored post on Instagram. And 97% of them charge no more than $500 for each Instagram post. Blog posts are slightly more expensive, with 87% of micro-influencers charging $500 or less for each piece. But 96% of micro-influencers wouldn’t charge you higher than $1000 for one blog post. 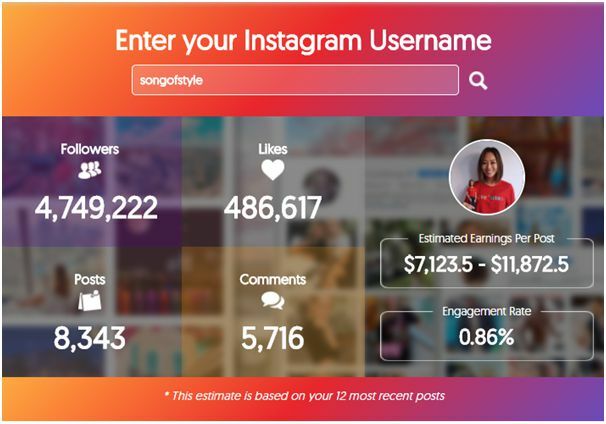 Based on insights from the study, you could reach about 200,000 Instagram followers with a budget of $5000. 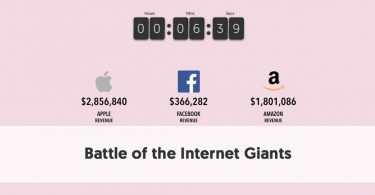 For the same amount, you could reach 125,000 Facebook users, 315,000 Twitter followers, or 315,000 blog subscribers. If you’re a marketer, don’t take it for granted that each and every influencer you approach will want to work with you. An Influence.co study found that at least 45% of influencers receive about four proposals for influencer marketing campaigns every month. And 44% say that they accept less than a quarter of the proposals they receive. Only 24% accept more than 50% of the offers they receive. So it’s important to ensure that you only look for influencers who are highly relevant to your brand. And your brand should offer some kind of value to these influencers in order to win them over. What’s surprising is that many brands still fail to show influencers how much they value their work. 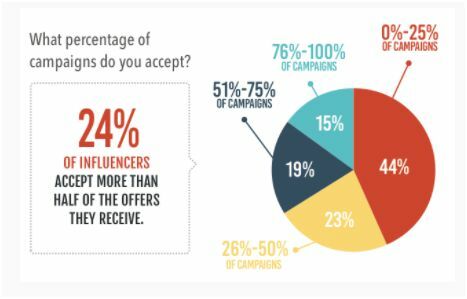 The previously-cited Influence.co study found that only 32% of the promotional campaign offers influencers receive offer cash. This can be highly damaging to the relationship between brand and influencer since the main goal for 69.4% of influencers is to earn money. It’s important for brands to realize that influencers are highly valuable content creators. They have their individual needs and expectations, which you will have to consider when partnering up with them. You’ll have to consider the value of their posts before approaching them with an offer, so you could approach them with a very realistic one. You can use the YouTube Money Calculator and the Instagram Money Calculator to calculate how much an influencer’s post is worth. Each of these tools will take into consideration metrics such as following size, engagement rate, etc. to come up with a realistic influencer worth. Authenticity is the key factor that contributes to the success of influencer marketing campaigns. People who look up to influencers trust them for honest feedback and reviews on different products and services. At the same time, the content tends to be much more trustworthy if the influencer infuses their authentic voice into it. Even in the previously-cited Hashoff study, originality and authenticity seem to be highly important considerations for influencers. They are what keeps their followers engaged, and what will continue to engage them. If influencers wish to maintain their followers’ trust, they need to keep creating authentic and original content, even when it’s a sponsored content for brands. This is why brands have a much easier time winning consumer trust when working with influencers. Many content creators have the ability to showcase the product as part of their everyday lifestyle. This is very natural, and can help in winning the trust of their followers. Unfortunately, not enough brands are providing influencers with creative control over sponsored posts. And 12% of influencers in the Influence.co study said that they typically have little to no control over the copy they create for a brand’s sponsored post. If you wish to win your customers’ trust through influencer marketing, make sure your influencers have creative freedom. 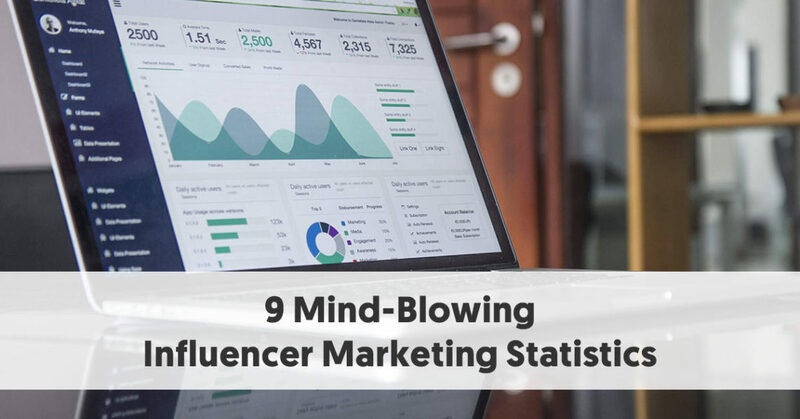 These are some of the most interesting statistics about influencer marketing. 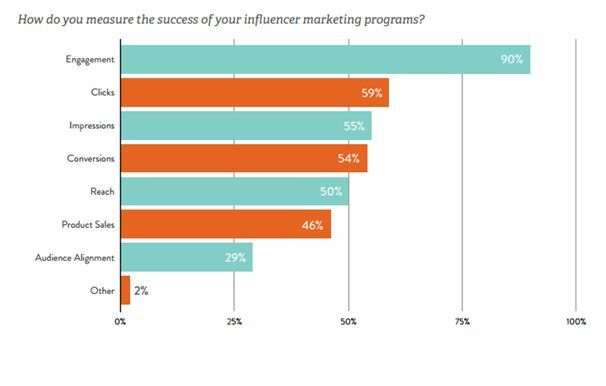 You can see that many marketers are increasing their influencer marketing budgets. So you might want to follow suit, and see how you can invest your marketing dollars on influencers who can deliver the desired results. You should also have a plan in mind for tackling the issue of ROI measurement. In addition to this, marketers need to boost their influencer relationships by considering their need for creative expression and monetary compensation.